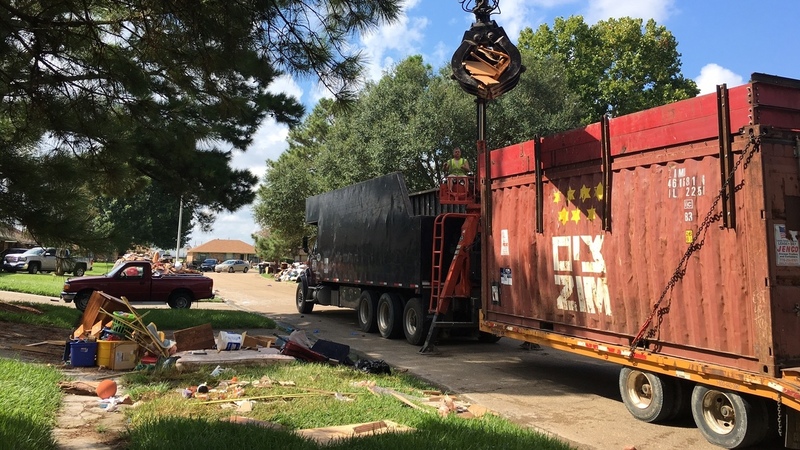 Cleanup Crews Roll Through Baton Rouge After Louisiana Flooding In flood-ravaged Louisiana, a cleanup contractor that specializes in disaster recovery operations helps Baton Rouge clean up debris. Cleanup crews say the destruction is much worse than reported. Cleanup crews roll through East Baton Rouge picking up debris from massive floods that ravaged the state last week. Enormous trucks from all over the country are rolling down highways toward Baton Rouge, La. When they get to town, their task is to clear neighborhoods where streets are lined with trash from last week's massive flood. Baton Rouge contracted with DRC Emergency Services to handle disaster response when the floods began last week. It started out rescuing people in boats, and now that the boats are docked, trucks are coming in to handle the cleanup. Kurt Thormahlen of DRC Emergency Services tells NPR's Ari Shapiro the flooding in Louisiana is different from other disasters because nobody saw the storm coming. "We started here on Saturday of this week, and picked up 12,000 cubic yards [of debris] yesterday. I anticipate probably 60 to 90 days here in East Baton Rouge of just debris removal." Use the audio player above to listen to the full story.